Kollwitz Stamp recovered from SCP-2275 correspondence received at Site-67, 3 February 2002. Special Containment Procedures: Site-67 is to maintain a cover organization (see Asset File FO-4228/19/67/78, "Združenje Zbiralcev Znamk Vzhodne Slovenije") dedicated to covertly identifying philatelists of Slovenia and surrounding regions. Individuals flagged for heightened probability of contact by SCP-2275 are subject to interception of all postal mail for monitoring. Flagged individuals that are subsequently contacted by SCP-2275 are to be provided with a wide variety and number of postage stamps through Združenje Zbiralcev Znamk Vzhodne Slovenije under the auspices of member appreciation efforts until such a time as all anomalous phenomena occurring in the vicinity of the individual cease. At the discretion of the Research Director, a Designated Research Subject residing at Site-67 is to be periodically made available as a potential SCP-2275 contactee for the purposes of studying correspondence and phenomena generated by the anomaly. All SCP-2275 correspondence is to be maintained in the Site-67 Archives. Description: SCP-2275 is an unobservable entity capable of generating posted mail to certain recipients and affecting localized changes to currently understood reality in the vicinity of these recipients. After review of archival documents from the defunct Imperial Commission on Transgressive Occurrences (obtained pursuant to the Debrecen Agreement of 1990) and subsequent experimentation and analysis, researchers believe SCP-2275 to be a Class Keres thoughtform entity. SCP-2275 generates and sends correspondence to individuals in the vicinity of Ljubljana, Slovenia with a demonstrated interest in philately1. To date, 61.5% of persons contacted by SCP-2275 in this manner have resided within a 75 km radius of Ljubljana, with the remaining cases scattered throughout the region of Southern Europe. Prior to establishment of current containment protocols, as many as 800 individuals were believed to have been receiving SCP-2275 correspondence. Correspondence sent by SCP-2275 always bears a Kollwitz Stamp2, along with sufficient Slovenian postage for delivery to the intended recipient. No return address is present. In each case, the contents are a single sheet of paper, folded into thirds, featuring a handwritten phrase or series of words in Slovenian. The handwriting in each sample is consistent with that documented in Imperial Commission on Transgressive Occurrences Dispatch No. 37. Refer to Addendum 2275.1 for a representative sample of SCP-2275 correspondence. Individuals who are intended recipients of SCP-2275 correspondence are subject to a series of local disturbances in reality. These phenomena decrease markedly in frequency and intensity if the affected individual continuously obtains and catalogs postage stamps. Most documented subjects intuitively grasped this relationship upon the initiation of these disturbances, and established or increased their stamp collections accordingly. Researcher's Note: The following is a transcription of a dispatch from the Imperial Commission on Transgressive Occurrences, an agency of the Austro-Hungarian Empire active from 1830-1839. Headquartered in Budapest, this agency was tasked with investigating what would be contemporarily termed as paranormal activity. Archives of this agency were turned over to the Foundation following discussions with Soviet authorities in 1990. Translated for this file into English from the original Hungarian. This Commission notes for the records and benefit of the Voivode a curious incident reported by Lovrenc Košir, a public official of the Empire who has attained renown for his innovations in the postal system. In my visit with Mr. Košir at the Ruszwurm coffee house, he described to me how he conceived of his celebrated invention. The idea of developing a system of postage that would eliminate the burdensome prospect of payment upon delivery of parcels, Mr. Košir described, was one that took hold of his person, dominating his thoughts and waking hours. He came to playfully imagine this all-consuming desire as a species of muse, such as those fancifully described by artists and poets and the like. He termed his muse "Philatea," and would often invoke her presence when sketching out designs for his stamps and drafting protocols for their deployment. The first letter he received from "Philatea" was shocking to Mr. Košir, as he had not told anyone of his imagined inspiration for his idea, nor even discussed his innovation at all except with peers in the Ministry and abroad. The level of detail with which Philatea described Mr. Košir's idea and his passion for seeing it adopted was highly uncanny, and no reasonable explanation of how anyone could write with this knowledge was apparent. In spite of the somewhat otherworldly nature of this letter, Mr. Košir was moved by the eloquence and shared ardor for his idea with which Philatea wrote. As I read the contents of the mysterious letter, I had to agree. Whoever this woman was, she was filled with grand ideas about the importance of correspondence, of shared understanding between all quarters of humanity. I read the letters that Mr. Košir received, and I could not help but be inspired with a vision of a grand Brotherhood of Man, so beautifully elaborated in this woman's elegant script and flights of poetic phrase. Mr. Košir responded to his newfound associate in turn, and began an intensive correspondence, which he confided to me as being largely responsible for his thought processes in developing the particulars of how his system of stamped postage would be implemented. Mr. Košir showed me the letters he received from his partner in this venture, and drew my attention to the fact that Philatea's correspondence already bore stamps such as those that are now common in the Empire but were unknown at the time. These stamps featured the hopeful countenance of a young woman, the small portraits echoing perfectly the enthusiasm which Mr. Košir described himself feeling as he pursued his idea. Once Mr. Košir submitted his plan to his superiors and saw the fruits of his labors realized, he ceased his correspondence, letting several congratulatory letters from Philatea remain unanswered, as he attended to other matters in his life and moved on to new professional pursuits. Eventually, the letters stopped arriving. I am told by Mr. Košir that he had heard of our Commission and our investigatory duties in his work in Vienna, and wished to report this curious event. Mostly, so he said, out of a desire to see if Philatea was indeed a real person, to whom some credit for his successful invention should be given. I do get the distinct impression, however, that Mr. Košir is somewhat troubled by the mysterious provenance of the letters that he displayed to me. The unusual nature of our meeting notwithstanding, my conversation with Mr. Košir was an enlightening and pleasant one. He did leave me, by way of our parting exchanges, with a sense of unmistakeable regret on his part, a sort of sorrow at the loss of this fantastic correspondence. He wistfully remarked, as older gentlemen are wont to, that he wished the matter had been just a little different, that he had not laid aside this mystery of his as he pursued the later course of life. The notability of the personage involved in this occurrence is certainly unusual, and I believe the matter is worthy of further study. I have enclosed the correspondence referenced above, which Mr. Košir has so kindly provided to us for our purposes. We shall speak more of this when I arrive again in Buda Pest a fortnight hence. 1. The study of stamps and general postal history. 2. 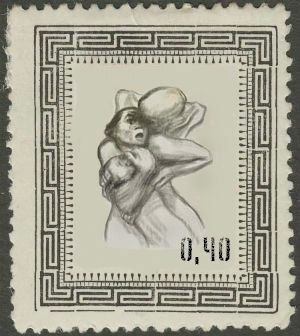 A unique stamp found only on SCP-2275 correspondence featuring a depiction of the 1934 Käthe Kollwitz lithograph "Tod packt eine Frau"